People asked me what I did in the school holidays. My answer? "Oh, I just watched five movies on the Holocaust..." It got to my head a little bit. Now, I'm weirdly interested in everything that went on through this truly horrible, what-the-hell moments in our history. Amongst my Holocaust viewing selection were only the very best...my new favourite movie Schindler's List (I made my mum sit down and watch it this time), the brilliant French short film Night & Fog, the surprisingly happy Life is Beautiful and Roman Polanski's amazing tale of survival The Pianist. As I said, only the very best. 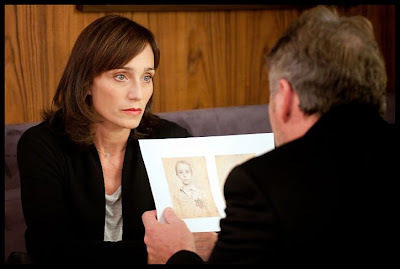 But one film that, while not as good as any of those other films, stuck with me for quite some time was Sarah's Key, a French/American adaption starring the seemingly ageless Kristin Scott Thomas. Yes, you need to see it. So, our age defying Kristin Scott Thomas is but a small part of this movie depicting yet another event in the Holocaust. She plays Julia Jarmond, who is American but lives in France (in present times), being a journalist. One of the stories she is currently covering is to do with the notorious Vel' d'Hiv Roundup in 1942 - where many Jews were sent to stay in a velodrome in inhumane conditions before being sent to concentration camps. The movie delves into that story, this time following a young Jewish girl named Sarah (Mélusine Mayance), who is sent to this velodrome with her mother and father. Knowing that the police were going to take her away, she locks her brother Michel in a closet and tells him to await her return. As Sarah and her family are forced to stay in the velodrome for a few days, later being transferred to a transit camp and then being separated as her parents are forced to go to concentration camps, she tries desperately to get back to her brother. What does this have to do with Julia Jarmond? She's just moved into the house where Sarah's key could have unlocked her brothers freedom. Sarah's Key ultimately falters with it's weak dramatic side in the modern part of the story, dealing with abortions, divorce and everything in between...but that's no matter. Its through this modern period that the audience can be schooled on not only an infamous part of the Holocaust, but also see the effects this kind of trauma has on a person, especially seeing as Sarah's future son had no idea about what really happened to his mother back in those times. Yes, the film is definitely at it's best when it is recounting Sarah's struggle to get back to her brother, and then showing her decline as her past all becomes too much for her. The portrayal of the Vel' d'Hiv Roundup (something I didn't know about until watching this film - again, I lost my faith in humanity) is quite short in comparison to the rest of Sarah's story, but it still manages to hit to brutal chord. From the moment you see someone jumping to their death from one of the higher levels of the velodrome, all memory of the joyous opening scene - Sarah and Michel laughing and playing - is gone. You could say that many of Sarah's Key's flaws are covered up by the genuine shock of what happens in the movie, mainly because the scars of the war never really heal. But does it really matter when the film manages to handle a young girl's traumatizing experience and tale of survival with gentle restrain? No. 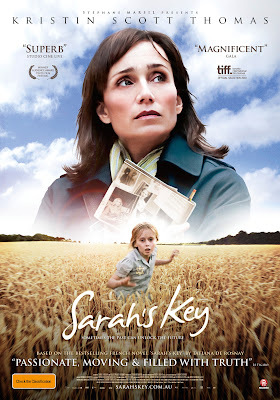 Truth is, Sarah's Key is a masterpiece in handling the resounding effects of such an experience on a person. Luckily, these resounding effects reach all the way into the weakened modern part of the film, with it's devastating twist on the 'you-think-you-knew-someone-but-really-you-didn't' story. In short, I absolutely loved Sarah's Key, for it's perfections and imperfections. Kristin Scott Thomas is ever reliable in her mostly investigative role which does have her in action a lot, finding all of these links to Sarah, and also dealing with an unwanted pregnancy. Young Mélusine Mayance was brilliant too, showing genuine fear and heart with her difficult role. The cinematography was as beautiful as ever. This is a film which I really have to recommend...while it may not be as great as the likes of Schindler's List or The Pianist, it definitely has a lot of heart, which gets it through. THE VERDICT: A shocking and traumatizing account of the notorious Vel d'Hiv Roundup and it's resounding effects, Sarah's Key is a beautiful and stirring film. If a little let down by it's weak modern half, the film is backed by a brilliant Kristin Scott Thomas. Great writeup Stevee, I've been meaning to watch this one for awhile now. This is out on video already?? It hasn't even played in cinemas in the US or the UK!!! I saw this on the big screen several months ago. It did very well at the Kiwi box office too. It is by far the best holocaust film I've watched in years. My only gripe was so much attention was given to Thomas and this is defintiely NOT her film, it is the French girl's who played Sarah in one of the best child performances you could ever hope to see. It's key point is 'survivor guilt' which is so often overlooked as a result of the Holocaust on its victims. I've read a fair bit on this period of history and can attest to its authenicity, and for me flaws and all, this is one of the best films made on the Holocaust. I can't speak highly enough of this film and just haven't been able to review it as I can't put into strong words the impact this has on the viewer. It is slightly flawed by the length for me. The last scene in the restaurant felt tacked on and added an un-neccesary few minutes. But it is a minor quibble because overall it is a fine film and the best of the year for me by faaarrrrrr!! You have to see it if for anything else just to see the performance of young Sarah. Haven't seen this one, but I feel like I have enough of Holocaust. As a German, I had to watch dozens of movies about it in school, read dozens of books about it etc. and I just have enough. 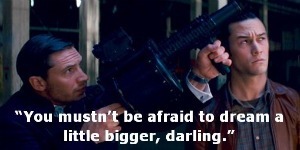 However, my favorite films about it would also be Schindler's List and second The Pianist. Bonjour Tristesse - Thanks! And please do, it's so great! Brent - It got released in the US about two weeks ago! But we've got it really fast. It played at our cinemas right up until it's DVD release date. That's impressive! I totally agree with everything you said. Too many films don't look at the aftermath of the Holocaust, but this film does it perfectly. I thought reviewing it would be easy, but it was so hard. All I know is that it affected me so much...I couldn't really put it into words! Lime(tte) - Fair enough. I'm scared of when we have to watch Schindler's List in English, and we'll do all this stuff about it that I might start getting really annoyed by it even though it's my favourite movie...I highly doubt that will happen, though! Custard - If you can, definitely do! It's so good. Scott Thomas is lovely! She never ceases to amaze me.